It has been a great week watching the World Athletics Championships. It is always full of surprises & exciting performances. In the heptathlon the top 5 athletes from last years Olympics were not even there which made it interesting. You get athletes that have made massive progress in a year & some that seem to have gone backwards. As with the heptathlon people are missing due to injury. Why – because it is tough to get the balance of training right. 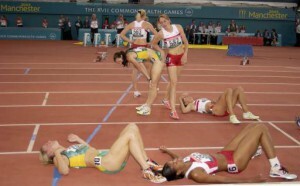 Under train and you do not get the improvements that you are looking for, push yourself too hard & the body breaks down. Like athletes we are all trying to achieve goals in our life and most of us want to give it our best to be successful. Those that do succeed are the ones that get the balance of how hard to work just right. We all know that exercise is good for our health and well being but lots of people fall into the trap of ‘if exercise is good for you then more is better”. To improve you need to work hard, no pain no gain, you need to beast yourself every session. However, this is not the case you must remember that most fitness gains happen during the recovery – Yes REST is needed to benefit from your training. If you stress the body systems in the same way day after day your fitness gains will be reduced and your risk of injury will be increased. On the flip side if you do not push yourself and stress the body systems regularly and progressively then the body will not adapt and your fitness will not improve. If you over train your body will breakdown, you will plateau, get ill or injured. If you under train you will not get the results that you want and will probably get bored & give up. 1. Are you getting the results you want? The best way to know if you’re working out hard enough is whether or not you are getting results. However, it can take 4-8 weeks to actually notice physical changes, like toned abs, bigger biceps. (It will take even longer if your diet is not supporting your training) If after a couple of months you are feeling fitter, you have improved your fitness test scores, noticed that you are lifting more weight, doing more reps in a circuit, running faster times but your body hasn’t changed, it is due to improved neuromuscular, and cardiovascular efficiency, not changes in muscle size and tone. To get these physical changes you need to start increasing the intensity of your workouts, (lift heavier weights, do the more advanced exercises, work faster & harder) you will then start to physically see your results. No one said it was going to be easy. Just turning up & going through the motions is not going to give you the results that you want. 2. How you feel during a workout? The different types of training have different effects on your body systems. 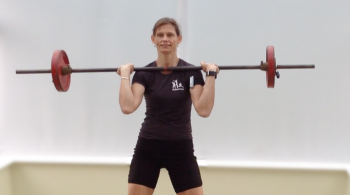 Strength training – in order to make strength gains you need to stress and overload the muscles which will cause some micro trauma in the muscle fibres (the muscle fibres tear which will cause some soreness) Then with adequate nutrition & rest the muscle fibres will repair and adapt. There will be overcompensation, the muscle fibres will increase in size, there will be better recruitment of the muscles by the nerves and the body will be able to cope better next time it is required to do the same work. If you can perform more reps than your target number of reps with good technique then the weight / resistance is not heavy enough. Anaerobic & Muscular Endurance training – in order to improve your ability to work hard for longer you need to be able to delay muscle fatigue. Muscle fatigue is controlled by the central nervous system (mind & nerves) our energy systems and the muscles themselves. Our brain has a protection mechanism, it will try to protect our muscles from tearing when working hard by telling them to shut down. Therefore we usually think & tell ourselves that we are tired before the muscles actually stop working. During high intensity work as in sprinting, weight training and circuits, lactic acid is produced in the muscles. That is the burning sensation in the muscles which is a physical warning that we need to stop. (It will eventually saturate the muscles & completely stop you moving.) In order to delay muscle fatigue and improve your endurance you need to mentally push yourself beyond what is comfortable, go beyond feeling tired and push through the burning sensation of the lactic acid. These workouts are generally the painful ones to perform and have the very highest perceived effort. They are taxing on both the muscles and the neuromuscular system so require a fair amount of recovery. Aerobic – cardiovascular – used to improve the efficiency of your heart and lungs, to enable you to exercise faster for longer. For a significant training effect the aerobic exercise must increase your heart rate and your oxygen consumption. There are several ways of monitoring exercise intensity during aerobic exercise. Monitoring your heart rate and using a scale of perceived exertion (1-10 measure of how hard you think you are working) are the most common ways of determining if you are working at the correct intensity. Without heart rate monitors the talk test works well for most – If you can carry on a light conversation while exercising, then you are in a good intensity range. Once your speech starts to break, slow, or cause discomfort, you are working too hard. 3. How you are feeling after a work out. Post workout you should initially feel tired but not so much that you are collapsed on the floor, or need to go to sleep. You should feel a little sore post strength training but not so much that you can’t sit on the toilet or put your clothes on. More and more people are switch to using High intensity interval training as it is a fast and effective way of improving your fitness. Why go for a 60 minute run when you can get the same training effect (improvement in aerobic capacity & number of calories burnt) doing a 10 minute high intensity workout. As a result overtraining is becoming more common. People beast themselves to the limit day after day doing HIIT. They start to feel that they have not done a productive workout unless they are collapsed on the floor in a pool of sweat, screaming in pain from the lactic acid or they are straining with eye balls popping out on every lift in the gym. If you are not getting results, you are not feeling what you should be feeling in the session and you find that your mind is wandering when you are training. (ie. you are planning the rest of your day or you are checking out everyone else around you) then you are probably under training. So get some focus, push yourselves out of your comfort zone and then you will start to see some results. The signs and symptoms that you are overtraining are not always easy to spot. Reduced or a plateau in physical performance. Have a think whether you are getting the results that you want & the balance of your training right. If you want to experience a full body balanced & progressive training programme & complete nutrition plan then register now for a trial week on one of our programmes that will be starting in September.